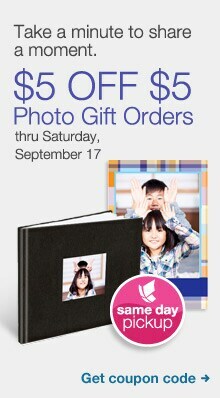 Walgreens has a great coupon code out right now to take $5 off any photo gift order of $5 or more. I checked around on some of the gift options and the collages and prints do not work for this code. But the 4x6 flip books that cost $4.99 do work for this code. The flip books do have to be shipped to your home (shipping costs $1.99). There are also lots of more options – coffee mugs, placemats, aprons, mouse pads and much more. So go check out all the photo gift options on Walgreens site and remember to use the code 5offany to get $5 off your order.